Julie Tippetts, long-time jazz songstress, initially famous for her association with Brian Auger in the 1960s, and Martin Archer, a multi-talented independent Sheffield based progressive musical adventurer, continue their partnership with Vestigium, their fourth album to date, further extending their exploration of the songform. The first song, Mandolin Song In Orange is a musically intricate yet fragile thing, giving way to a mournful brass chorus, over which Julie sings her way through memories of a Parisian affair. Shiver Across The Soul marries double bass, electric piano and gentle electronica and recalls John Martyn in the way it expresses warmth with emotive heft. The duo’s experimentalism comes to the fore on Like Alice, with an abstract semi-spoken vocal from Julie over minimalist tinkling and percussion, producing a vaguely unsettling air. These three tracks establish the template, and show a musical partnership reaching maturity after four lengthy albums, completely at ease with one another and unafraid to take risks in the name of their art. Throughout the CD cover and booklet there are background shots of footprints on a beach in various states of watery dissolution, illustrating the album’s title. This acts as a parallel for the music, which has an elusive physical form, preferring instead to conjure fleeting wisps of smoke in the air, drifting near but unattainable. This wheel is past fire, the spokes are now merely tendrils of smoke. Trance-like and soothing, The Beckoning builds in layers as Julie’s multi-tracked and looped voice rises then eventually subsides, to be replaced by a gently contemplative guitar flurry that sees out the song. Occasionally Julie’s voice, always portraying the cares and wisdom of a life well lived, combined with Martin’s and the other musicians’ spacious jazz and electronica puts me in mind of Joni Mitchell in her mid-70s Pastorius phase. This thought occurred to me during the ethereal Firefly, a highly poetic depiction of love and the spark of attraction, and typical of the high quality of Julie’s lyrics. She writes from the soul, discussing matters of the heart, love and lust, defiance, separation, redemption, wonderment, all in a conversational style as if sung into a mirror. These words can be transitory and impressionistic, and like all good poetry leave the listener to make his or her interpretation. The music is equally intangible and the conventional instruments are only part of a soundstage that comes from a mix of jazz instrumentation, electronica and sampling via laptops. When all this collides with Julie’s conversational style as on Secret/Lily Pollen, the results are deeply soulful and texturally rich. Strangely or not, Martin’s avant-jazz piano on this song is highly reminiscent of Julie’s husband Keith Tippett. The second CD opens with the quietly sinister pulsebeat of Shock Waves, the sound of horns and electric piano over rumbling electronica soothing a rising and erupting anger. 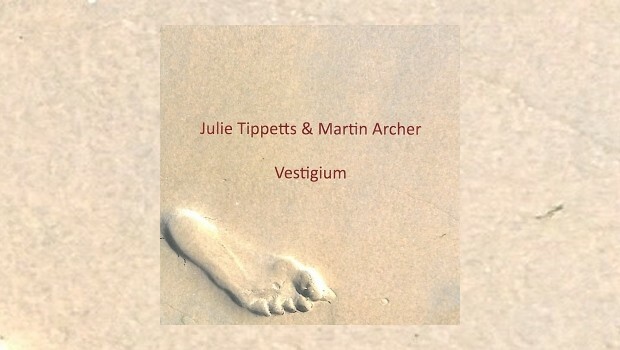 The aural palette throughout Vestigium is deeply thoughtful, whether painting a relatively conventional picture as on this first track, or leaving a highly impressionistic and minimalistic pattern as on the following The Disappeared Mountain, which is little more than Julie’s nature and nurture poem over the barest of music, all sonic curlicues and whispers. Too Cool, with its lyric borne of experience and dignity dances its way across the room, to be followed by the strangest track on the record, the experiment in dark electronica and surrealist poetry that is Soliciting Crabs, and once again the placing of the conventional groove next to the downright odd makes for a big contrast, this time the most startling occurrence of that particular trope on the album. The titular ephemeral nature of Vestigium is summed up in the title of Clutching At Dust and its opening line “Falling away…slipping away…clutching at dust”. The presumably synth bass line to this one is straight out of a Massive Attack funk groove, topped off with some great horn blowing, and I defy you not to skank to it…in your head at the very least. Coming as it does after the synapse-stretching Soliciting Crabs, we have yet another example of the “contrast and compare” technique that works so well on this album, particularly on this second CD. The album ends with the ebb and flow of a rising tide that is Stalking The Vision, a marvellous slice of multi-tracked voices and ambient jazz with a rare and rather nice asymmetrical guitar break from Gary Houghton. Whereas some of the duo’s earlier albums have at times seemed wilfully obscure, the odder moments on Vestigium are simply effortless, and just “be”, in the most Zen-like manner. As a result this album is a triumph of intelligent songwriting and intelligent arranging that will enthral any adventurous listener. My forays into truly progressive music seem to have taken a distinct turn down a jazz highway of late, and this is another one from that oft misunderstood route in the musical road atlas that will certainly feature in my end of year list. If you like adventurous music, regardless of whether or not it falls under the jazz umbrella, then this enticing record is for you. Note: There are no YouTube or other links to find, but if you click the link “Audio & Info” below, there is a 12-minute sampler of the album embedded in that page.